Glass pony beads, 200 piece mix, size 9mm wide x 7mm thick with 3mm bead holes. 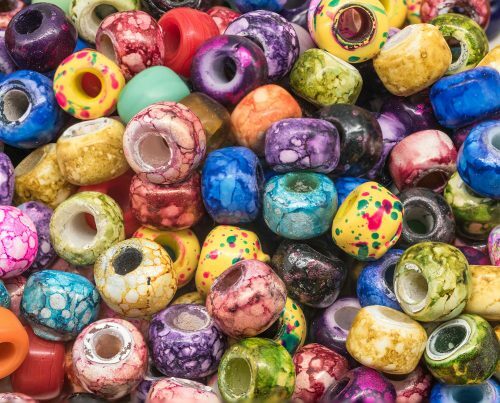 These beads are made from glass and some have a marbled or stone pattern and some are plain color. Large hole glass beads for jewelry making, made in India. Sold in bags of approximately 200 pieces, mix color, colors will include a variety of plain and marbled beads. Please note: Shades of color may appear lighter or darker on different computer screens. Items may appear larger or smaller in the photo please check the size. Dimensions and hole sizes are approximate and may vary between batches and strands.